The performance team of Four Dreams, a series of Kunqu plays by the Shanghai Kunqu Opera Troupe, will be announced the winner of a special Magnolia Award on Friday. The Shanghai Magnolia Stage Performance Award is an annual celebration of live theater art in the city and the 29th edition will be held at the Shanghai Grand Theatre on that night. A total of 60 productions from 24 categories such as Peking Opera, Kunqu Opera, musicals and dance theater are in the running for the prize this year. 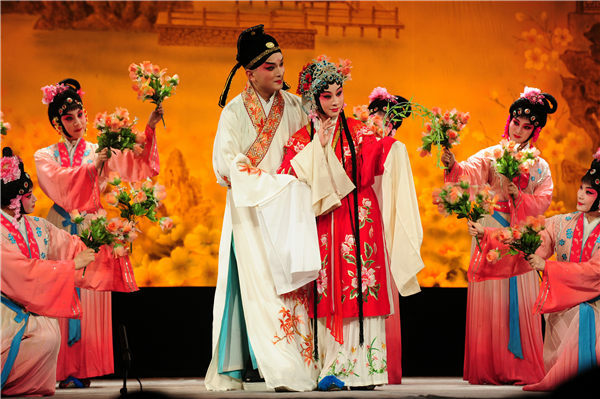 The Shanghai Kunqu Opera Troupe produced a series of productions of Four Dreams by Tang Xianzu (1550-1616) in 2016, the year that marked the 400th anniversary of his death. Tang is often described as China's William Shakespeare because of his importance in Chinese literary history. The Four Dreams series of plays is considered his most important theatrical creation and it is named as such because dreams play a crucial role in the plots. The 2016 production of Four Dreams was one of the largest projects the company has ever made. That year, the production held 60 performances all over the world. In 2018, the plays went on to tour Austria and Russia and participated in the Performing Arts Festival in Berlin, Germany, winning high praise from audiences and critics. The performance team of Four Dreams will be announced the winner of a special Magnolia Award on Friday.